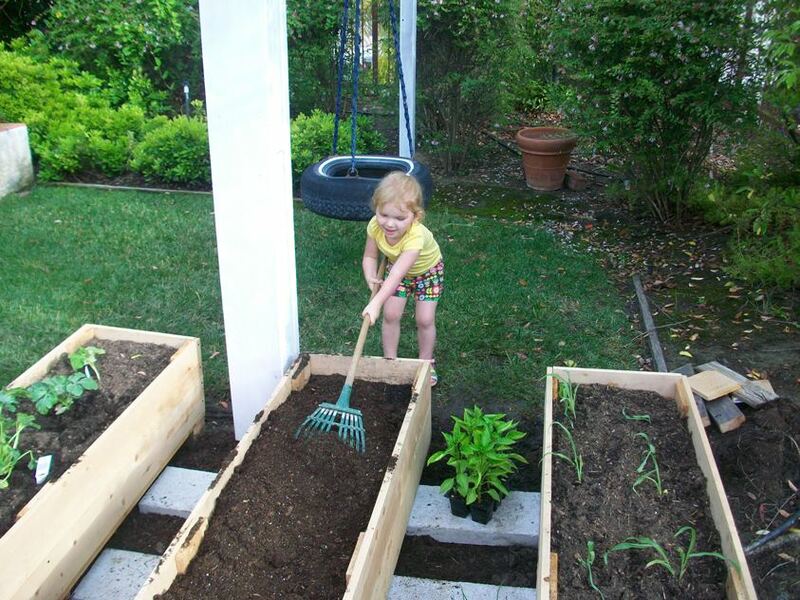 Katie helped her grandparents plant a small garden on Thursday. My parents have green thumbs. Probably my mom would say that it is my dad who has the green thumb, and she would be right, but I think the nice thing to do is to give them both credit since I know my mom dutifully does the daily watering. Their sweet peas are blossoming, and they have baby tomatoes and strawberries growing. I love their backyard. My dad recently took down most of my brother's play-fort structure, rebuilt a supporting post for the tire swing, and used the footprint of the structure as a space for garden boxes. Katie went with Amie and Boppa to the nursery on Thursday afternoon to help pick out some vegetables and other plants---though I hear she was a bit more interested in the ceramic doggy statues. I joined them a little later after the planting, and we played kickball together as the afternoon gave way to evening. Katie plays on the tire swing, the first time she has had a solo turn. What a big girl! 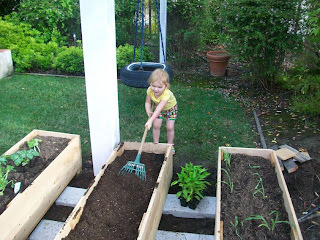 Helping her grandparents to rake the garden. Thursday was a fun day in our house. We started with our gymnastics class in the morning, and seeing Katie light up in excitement always makes me glow inside. We also stopped by the library and picked out several books, including a book of Shel Silverstein poems. I think children have a natural ear for poetry, and we've been reading all kinds of poems since she was very little. We have been reading Where the Sidewalk Ends quite a bit the past few days, and my mom found my copy of A Light in the Attic yesterday---which will be fun to have permanently now. After stopping at home for lunch, we made our next stop in Old Town to buy a few gymnastics leotards for Katie. I figured I would just eyeball her size, ask her about preferences, and choose...but the helpful owner suggested we use the dressing room to try them on. I thought Katie would not at all want to undress and do this....was I ever wrong! First of all, the dressing room was painted with ballerinas and had seat pads and a pillow and all kinds of pretty decorations. And then, it turns out that Miss Katie has entered the girly girl phase of unabashed affection for her image in the mirror!!! I say hurrah for that: I am glad she has such a good self-image actually. We've done everything we can to promote that. She is such a ham, though. We had about eight leotards (and a few little shorts) to try on. She knew which ones she liked and wanted to try first. We put them on, and in each, she spun around, practiced somersaults, danced, and bobbed around as though she were the cutest thing ever to don a leotard. I mean, I know that I think she is pretty cute---but apparently she thinks so, too! What a little munchkin, but good for her! On Friday, we had our penultimate music class for the year before summer break. We could take a summer session of music, but the songs will be all review and we have other activities planned, such as swimming lessons, gymnastics, and family events. I do feel a little tug on my heart, though, that music is winding up for the year. I remember our first class in October so vividly. 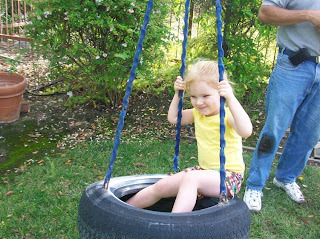 Katie was tentative back then, yet over these months she has totally blossomed. Watching her transformation in music has been astounding, moving, and exciting as a mother. We had been taking other classes prior to starting music, but I really think music has been her language by which to open up. She sings along and dances and loves her teacher so much. Prior to the music class, she mostly wanted to sit with me and watch our classes...but through music she has learned how to be confident and to involve herself, and this poured over this year into our other classes. The poignancy of motherhood is that on a basic level, we would love to have our children attached and near to us forever, yes? But we know as mothers that we only do our job if we teach them how to leave us or how to be independent and self-assured. It gives me great joy to watch Katie's independence in our music class, even while knowing that I am building the very foundation for her to be on her own and go to college and have adventures someday without me. We also celebrated Nana's birthday on Friday. Though it was too cold to swim, we had a delightful luncheon in her backyard. Katie has been doing really well with her "big girl potty" training. She is now using restrooms outside of the house: at music class, at her gym, at the library. She has had a couple of regressive days this week, usually following a day of total success. Not sure what that is about... But the progress is steady. We are using one diaper a day (for overnights). I use underpants in the house for her and training pants when we go out, just in case she has an accident. On days where she is focused and feeling like a big girl, she does not have accidents. Lately she has been wanting to revisit some of her babyhood rituals, though. Usually this follows a period of her talking about her baby brother... A couple of times she has wanted me to swaddle her in blankets and sing some of our babyhood songs to her. It calms her and she really seems to like it. Katie is doing well on her letter sounds, though I am a bit behind in prepping my lessons for her and her alphabet book. I finally made some progress yesterday, though, and so I think we will work on some of our workbooks today.